HVA Director Lynn Werner and New Milford Mayor David Gronbach. 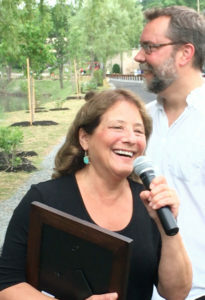 Celebrating the official opening of the Young’s Field Riverfront Trail on June 17, the second phase of the New Milford River Trail, HVA Executive Director Lynn Werner presented NMRTA Director Tom O’Brien with a Housatonic RiverBelt Greenway Award. The award recognizes significant steps towards the larger goal of creating a corridor of accessible public lands along the entire Housatonic River mainstem, linking recreation trails with parks, natural lands, paddling access sites, and village centers along the river’s 149-mile course. The vision is now 40 percent realized through improved land management, protected open space, access sites and trail rights-of-way in the 29 riverfront towns from the Housatonic’s source in the Berkshires to Long Island Sound. The Shelton Economic Development Corporation (SEDC) and the Economic Development Commission, recognizing the Shelton Enterprise and Commerce Park, a fourteen-acre riverfront light industrial site in downtown Shelton, which includes a park, farmers’ market, and pedestrian river trail.